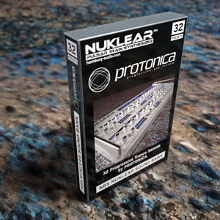 Hamburg Audio is proud to present a new free soundset for NUKLEAR from the Progressive Trance artists PROTONICA. Piet Kaempfer, passionate synthesizer freak, has created 32 patches with a great attention to detail. Get inspired by visionary and extraordinary patches including sequences, leads, basses, pads and spacey atmospheres which show you the great potential of NUKLEAR. Touring the globe as an Live artist and DJ you can expect well balanced high quality sounds which fits to your mixes.